Background: The most frequently used chiral auxiliaries, oxazolidinones (Evans' oxazolidinones) have been employed in 1,4-congugate addition reactions to α,β-unsaturated carbonyl compounds. Supplementary to our previous reports in this mini-review, we attempted to underscore the applications of this strategy in a step (steps) in the total synthesis of some naturally occurring compounds exhibiting diverse biological activities. Objective: In this mini-review, we try to underscore the applications of oxazolidinones (Evans’ oxazolidinones) in 1,4-congugate addition reactions to α,β-unsaturated carbonyl in the total synthesis of some naturally occurring compounds exhibiting diverse biological activities. Conclusion: In spite of well-known superiority of asymmetric catalyzed reactions, the use of auxiliarycontrolled reactions are still considered as commanding, vital and sometimes as only tools in the generation of stereogenic centers during the construction of complex molecules and total synthesis of naturally occurring compounds. The commercial availability, or readily accessibility of a wide variety of chiral amino alcohols as starting materials to synthesize a wide range of oxazolidinones is the merits of them. In addition, the ease of removal and subjection to various and diverse stereoselective reactions make oxazolidinones as the ideal and superior chiral auxiliaries. In this regard, they were successfully used in asymmetric 1,4-conjugate addition reactions with high stereoselectivities. The high degree of asymmetric induction can be attributed to the rigid chelation of N-acyloxazolidinones with metal ions, as well as the covering of one face of the system by the bulkiness of 4-substituent. 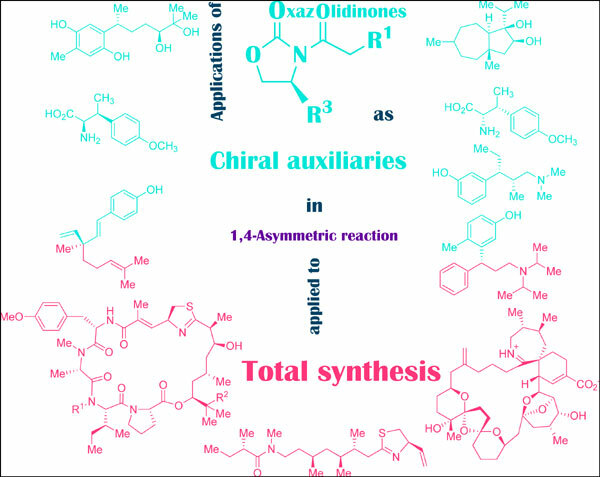 In summary, in this report, the importance of the applications of chiral oxazolidinones as suitable chiral auxiliaries in the stereoselective, 1,4-conjugate addition reactions in asymmetric synthesis and in particular, the total synthesis of naturally occurring compounds and some complex molecules were underscored. Noticeably, in these total syntheses, this chiral auxiliary is controlling the stereochemistry of a newly created stereogenic center as well as preserving the configuration of other chiral centers, which already have been presented in the precursor. General methods have been established for the attachment of the chiral auxiliary as a moiety to the substrate molecule in high to excellent yields. At the end of these reactions, this auxiliary can be easily removed leaving various desired reactive motifs for the next step in multi-step synthesis. Keywords: Oxazolidinonoes, chiral auxiliary, asymmetric synthesis, stereoselective, 1, 4-conjugate addition reaction, total synthesis, natural products. Keywords:Oxazolidinonoes, chiral auxiliary, asymmetric synthesis, stereoselective, 1, 4-conjugate addition reaction, total synthesis, natural products. Abstract:Background: The most frequently used chiral auxiliaries, oxazolidinones (Evans' oxazolidinones) have been employed in 1,4-congugate addition reactions to α,β-unsaturated carbonyl compounds. Supplementary to our previous reports in this mini-review, we attempted to underscore the applications of this strategy in a step (steps) in the total synthesis of some naturally occurring compounds exhibiting diverse biological activities.